Trumping even talks about the birds and the bees, discussions about your mortality can be one of the most difficult family discussions you’ll ever have. However, by neglecting to talk to your family about your plans for after your death, you may end up causing them undue stress, confusion, and hardship when that time does roll around. In some cases, a lack of open and honest communication about your estate plan could even reduce the amount they receive. Alternatively, an honest and upfront dialogue about your estate plan can ensure your family has a clear understanding of your decisions and the reasons behind them, thereby reducing mistakes, conflict, and wounded feelings. It can give them a sense of empowerment, allowing them to weigh in with thoughts and suggestions. By opening up discussion, you’ll also be able to confirm that chosen fiduciaries are up to the responsibility of managing trusts or other assets. So how do you get the discussion going? To help you begin this complex, often sensitive conversation, here are some important tips on how to best share your estate planning decisions with your family and loved ones. Plan ahead. Make an outline of key points to address and think about your family’s possible reactions to each of them. What may surprise, concern, or confuse them? Anticipate the questions and reactions that may arise during the discussion and plan on a way to address them. Create the right tone. It’s best to start the conversation during a period of relative calm, when your family may be more receptive to talk about sensitive matters. Throughout the course of the conversation, invite your family to share their opinions, thoughts, and worries, while discouraging heated arguments or emotional outbursts. Try to concentrate the conversation around life rather than death, focusing on how your plan will protect the financial interests and well-being of your family for years to come. Make sure everyone is on the same page. 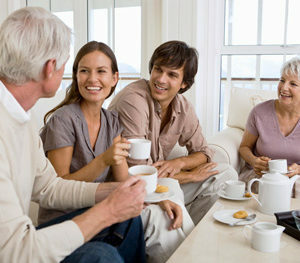 Consider bringing along copies of important estate planning documents. By allowing your family to see properly drafted paperwork that includes clear instructions and details your intentions, you can help minimize confusion and misunderstanding, while opening up the table to questions and concerns. Remind your family that this is an ongoing conversation. It’s important to remember that your estate plan may evolve with changing needs and circumstances. Let your family know that you may continue to alter and update your plan throughout your life and will regroup and discuss changes periodically. Enlist the help of an attorney. Since this conversation can be both sensitive and complex, you may want to bring in a professional to act as a facilitator. An Orlando estate planning attorney can offer family meetings to ensure everyone understands their roles as a fiduciary and the responsibilities involved.